We just wanted to say thank you again for letting us adopt Phyllis Baxter II. She is such a joy and has brightened our world so much. (She has also made me bend and stretch more which is good!) Phyllis is a sweet girl that just loves hugs and kisses and exploring her world. After a full day she goes to her bed in front of our chairs and lays down with one of her toys, then she finds her way to the floor between our feet! She's so cute! We can't get mad at her for no-no's as she learns very quickly what is right and wrong. She has not had but one accident in the house, but she does like trying to pull her sister's beds and blankets around when we are not looking! 🙂 We all love very very much and thank you so much for raising her with so much love and care. We wish you and yours a very blessed Easter. Today is the best day ever!! Today is the day my precious baby girl arrived in this world. I'm so thankful for her, she has brought me so much laughter and joy! I can't imagine my life without her. She's my joy, my angel, my baby girl! Thank you so much for bringing me this wonderful gift into my life!! 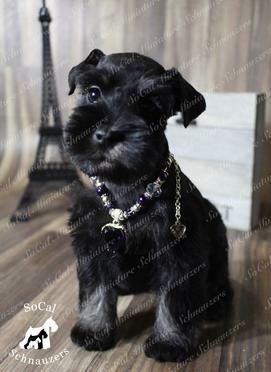 I am so grateful to have found SoCal Schnauzers and how you’ve contributed to our family. Both my daughters and I have pet allergies so we can only have hypo-allergenic dogs. 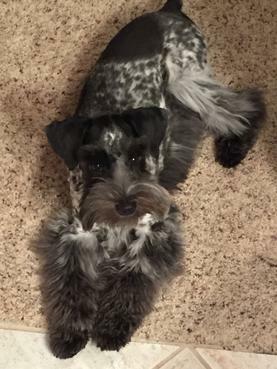 When we started our search for a new pet, we fell in love with the Schnauzer breed. Locating you just an hour away from our home was a piece of cake. You even allowed us to come by and test whether our allergies would flare up around the breed. After meeting you in person and spending time with your dogs, we were sunk. We fell in love with the breed and were ready to make a deposit for the upcoming litter. 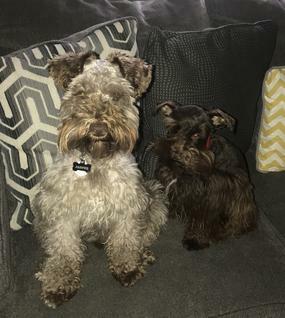 Since that first visit in November 2016, we have our male, mini-Schnauzer Jasper and our female, toy-Schnauzer, Rosie. Our home is filled with love and having these dogs be a part of that is a blessing. Thank you for your dedication to breeding such healthy and beautiful puppies and for always being available to answer questions, give advice and share puppy-milestones with. I just wanted to send a thank you note for taking such good care in raising your puppies. Making sure they’re in good health and making sure they have their shots and giving them every chance to grow healthy and loving pets. My puppies Charlie II and Lyla are now 1 year and 10 months old. Very happy, healthy and love getting their box from Pawtree. They get so excited. I just started grooming them myself. They are due for another haircut but I’m going to send a pic anyway. Charlie is very athletic plays with his football basketball and his tennis balls. Very muscular. Lyla keeps up with him no problem...stealing his football from him and enjoys chasing him around the backyard. So, Brittany, I want you to know that you brought so much joy to our lives. 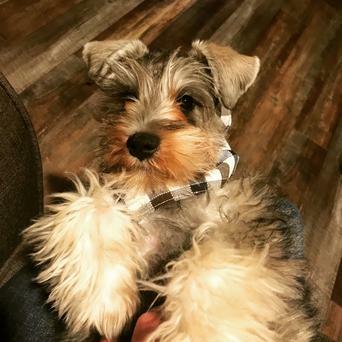 I am very proud to know that when I refer a breeder it is your dogs because I know your dogs are the best mini schnauzers and you know what you're doing in raising them. Most of all you care, truly care about the health and well being of the parents and pups. 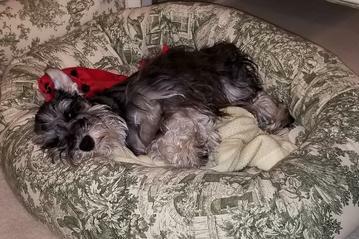 So we wish you and your family all the best Love all of you and we feel blessed that we adopted our Schnauzers from you. My vet has given his clean bill of health when they have to get a booster shot for rabies, Here’Here are two pics of Lyla and Charlie. Bailey is needing a grooming. She gets her last shot on Sunday 5/20. Grooming and potty training outside is next. We are having so much fun together. She is well behaved like you said. She is great at using her potty box, I'm super glad I purchased this from you. Thanks again! Words are not enough to describe how happy we feel to have found you! 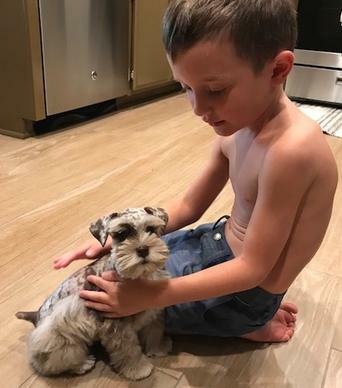 My family and I were searching to find a trustworthy breeder who would not just breed for a profit, but breed to provide care for the puppies as well. Nowadays is hard to find a breeder who really cares and is passionate about anything they do. 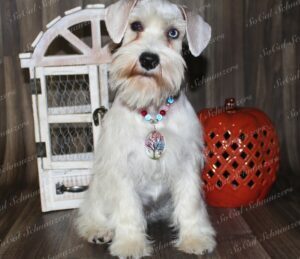 Our very first dog breed choice was a Schnauzer, for they are great with family, smart and obedient. The search was on and boy was I glad we found one in Southern California! I wanted to be able to meet and greet the breeder in person. We had a long drive, but family road trips are always fun and well worth it when all we thought about was our new family member, our puppy. As soon as I found out one was available, we immediately said yes and next thing we knew, we had Rocket at home with us! My two children love him to pieces and I am very glad Brittany was able to be part of this. We wouldn't have gotten him if it wasn't for her. We very much appreciate everything you do. Thank you so much for everything and hope you will always remember Rocket and us. We can not express how happy we are with our little Eva! She is energetic full of life so much fun and has brought such joy into our lives. The Vet was very impressed with how well the puppy was taken care of the documentation, and how she was already microchipped when she was brought in a very healthy little girl! 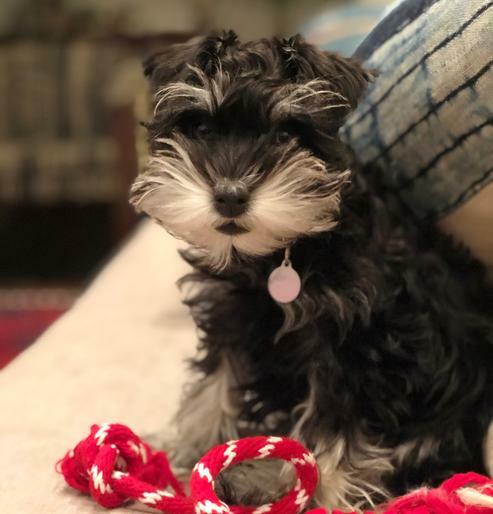 Everywhere we have gone we get stopped and asked a million questions where she came from, what breed she is and I’m proud to say that we got her from SoCal Schnauzers! Thank you so much for what you do, you do it well! Keep rocking it! We want to say thank you so very much for our beautiful baby girl, Dakota. She is just FULL of love and affection, the sweetest puppy. We are in love with her, she has brought so much joy to our family. We are so grateful for your care package, you spared no expense in providing the items Dakota needed. You have exceeded our expectations with her folder of important information. When we took our folder to our Vet, they were so impressed with all the important details you provided for us. And we definitely will be framing her Birth Certificate, it is just perfect. Words cannot express how grateful we are for our new baby girl Dakota. Thank you so very much for everything you have done for our family. I just wanted to update you on our beloved puppy (we called her Daisy) she’s doing absolutely great. She is sleeping through the night, potty trained, good at “come”, “sit”, “down” and leash work. I’m going to start “heel” soon. 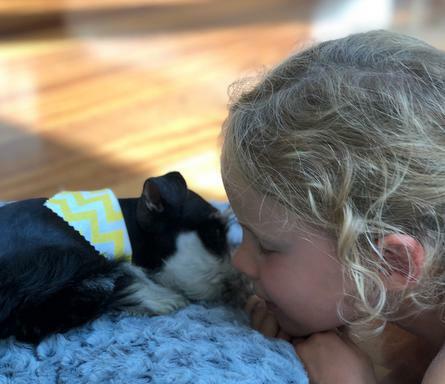 She is very chill, really sweet and affectionate and has slotted into our family life as easy as pie. We are so lucky to have her and she seems to be very happy. Thank you for all you did for us. We could not be happier with the process, your professionalism and, of course, our Daisy. 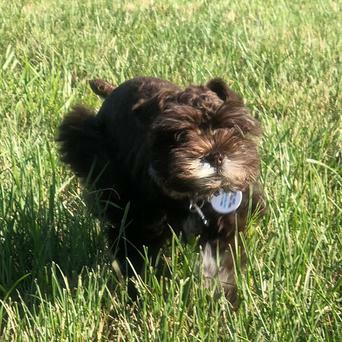 I see you had more puppies from Anna and Fredrick and wanted to send a current pick of Bella! 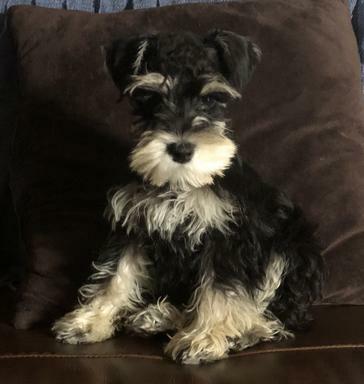 She’s 10 lbs now and she is absolutely the sweetest schnauzer and most loving and crazy smart we’ve ever had! She is beautiful and every single person that sees her tells me how cute she is! I will send more pics now! 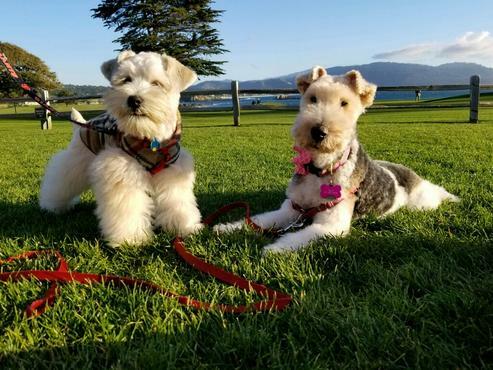 Brittany and SoCal Schnauzers have been so great to work with! Brittany always answers my calls or texts and is well informed on the breed. Thank you again and I would love to get her a sibling but 2 would be too much I think! ? hope you are doing great! 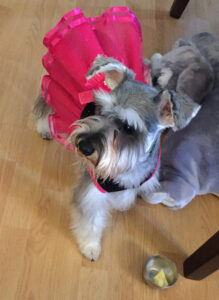 We lost our 14 year old Miniature schnauzer this past November ? ?my husband and I were heartbroken,, we never lost a pet before! 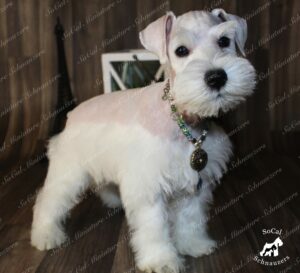 Tom did his research without telling me and then once decided that's what he wants for his 75th birthday I totally agreed,there couldn't be a better gift then having another Schnauzer in our lives!Our Bella was available right away, so we took a road trip from Las Vegas to Yucca CA to meet this lil gem! Brittany was very accommodating all the way through this exciting process! she is very professional, personable and definitely an incredible breeder! We now have Bella at her new home in Las Vegas for 6 days, she is beautifully adjusted! In this short time she has been spayed, fully potty trained in our backyard, eating her new food and healing incredibly well! We fell in love with all of Brittany's puppies, that we decided to commit to another puppy in the near future! 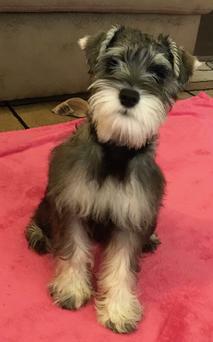 Thank You Brittany for doing such an incredible job breeding these amazing healthy , smart Schnauzers so they can fill many people's hearts with so much Joy❤️??? Hi Brittany! We just wanted to send a quick note and a picture of our beloved Penny. She is doing so great. She is so well behaved and loving and has slept thru the night without a peep since the first night we brought her home. We can’t thank you enough for our beautiful pup. We barely remember what life was like before we had her!